I love the Glenshire and Devonshire neighborhood in Truckee, California! 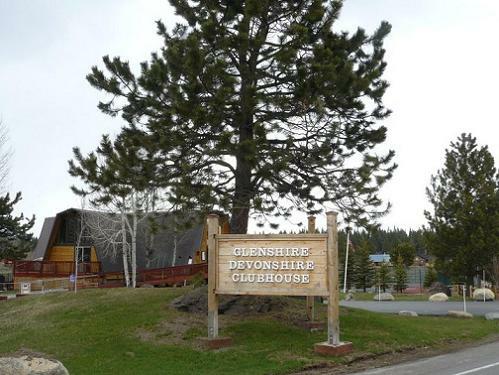 When I got a job in Truckee in 1995, and was looking at the area to find a place to live with my two children, co-workers advised me to look at the Glenshire area. 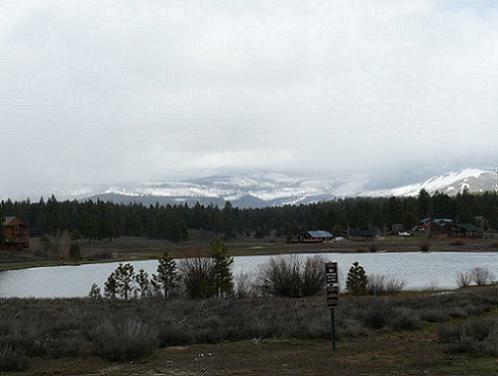 It was known as being a "family-friendly" community, and it was known for being the "banana-belt" area of Truckee - meaning it did not get as much snow fall as some of the other Truckee neighborhoods, such as Tahoe Donner. 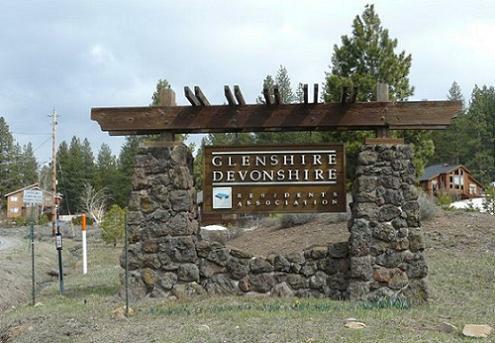 Glenshire is a community that is located about 6 miles east of the Downtown Truckee area, and is just 25 minutes to Reno, Nevada. There are two main ways to get to the neighborhood. The first, is from the Downtown Truckee area, you can take Glenshire Drive which parallels the Truckee River, then goes over a bridge, and up a hill and past the entry sign that is pictured above. The second way to get to the neighborhood, is from Highway 80, you can take the Hirshdale exit. This is the same exit that you would take if you were going to Boca Resorvoir or Stampede Reservoir. The Hirshdale hill is a steep and winding hill heading up to the Glenshire neighborhood, and is not for the faint of heart to go down in the winter time when there is snow or ice on the road!! You can also take a much longer way from Highway 267. The Hirshdale Hill leading down to Hwy 80 - a steep and winding 9% grade hill!! Glenshire is centered around the Glenshire Lake with many homes having a gorgeous lake view! This is one of the smallest of the Truckee Lakes, and usually freezes over and allows for ice skating during the winter months. As you can tell from the picture below, the area is full of gently rolling hills, lots of open space, and is surrounded by gorgeous mountain views! In fact, there are 236 acres of greenbelt located within the subdivision. The Glenshire and Devonshire neighborhood has a Community Clubhouse, with a Swimming Pool, and Tennis Courts that sit right next to the Glenshire Lake. There is also a barbeque gazebo, basketball court, and a playground structure. 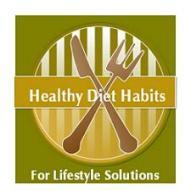 These are all maintained by the Glenshire Devonshire Homeowner's Association. There are also lots of equestrian easements in Glenshire and with many homes situated on 5 to 10 acre parcels, many homes have barns on the properties that are zoned for horses. With so much open space in the community, you just have to walk outside your home in winter, and you can find a place to snowshoe or cross country ski. And any hill you can typically find a group of kids sledding or tubing down during the winter months! In the summer months, it is a great place to bike, mountain bike or hike You can also walk, or drive down to the Truckee River for great fly fishing! The nearby Boca Reservoir and Stampede Reservoir is a quick drive for fishing, camping, boating, and water-skiing. We often went jet skiing with our neighbors at Boca, and took our dogs over to swim and hike around. 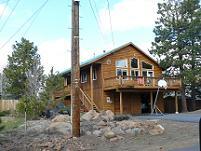 The Faith Baptist Church, one of the Truckee Churches has their services in the Clubhouse. It also can be rented out for parties or weddings. The Truckee Shopping and Truckee Grocery Stores are great, but Glenshire has it's own little shopping strip with some great stores, including the Glenshire General Store, which is especially helpful in the winter months, when you ran out of the necessities, and don't want to drive all of the way to Truckee or Reno for bread, or milk etc. That six mile stretch of Glenshire Drive that can take 5-10 minutes in the summer time, can take much longer in the winter months! There is also a video store, hair salon, music store, day care center, and a real estate office. My kids would love to ride their bikes down and pick up a video, and a snack at the General Store. The Glenshire neighborhood has it's own elementary school, appropriately called, the Glenshire Elementary School, which is a K through 5 public school. My kids were in the first class when the school first opened in the fall of 1995. Ryan was in the fifth grade, and was in the first graduating class, before he started at the Truckee Junior High, and then transferred to the Sierra Bible School. Brie started in first grade when we first moved to Glenshire. The kids loved the school, and it has the Glenshire Park attached to it, with a playground area and fields. The Truckee Donner Recreation and Park District, where I worked in town, also ran a before, and after school day care program right at the school, which was super convenient for me and easy on the kids! Juniper Hills - a gated subdivision that is private and remote with 10 to 20 acre parcels. The Meadows (and Buckhorn Ridge) - a gated subdivision with gently rolling meadows, with parcels that are 5 to 15 acres. Due to the distance from the downtown Truckee area, Glenshire has it's own Fire Station that is located next to the Elementary School. If you are considering moving to the Truckee area, I highly recommend this neighborhood area, especially if you have young children. It is a community where it is easy to get to know your neighbors, and there are subdivisions in the community in many different price ranges, from starter homes to large 20 acre estate size homes. 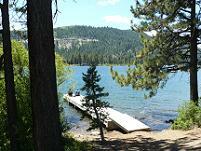 My kids have both said that Truckee was the best place to grow up! 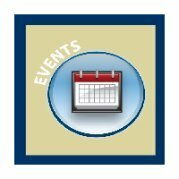 Please check out my Truckee Real Estate page, and my Truckee Neighborhood page for more information on the area, and don't hesitate to contact one of my recommended Realtors, who can assist you in finding your dream home! 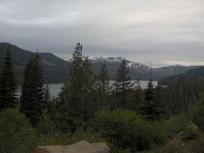 Living in Truckee is the absolute best!